Prairie chicken hunts are much like pheasant hunts, except a lot more walking. 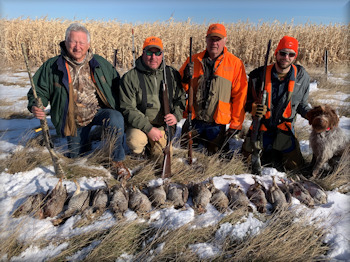 Some days can be a challenge like no other, but that's what makes prairie chicken hunts, offered by Missouri Valley Guide Service, what I consider to be one of the single greatest upland hunts of our generation. South Dakota boasts a wild bird population of over 11 million pheasants, compared to the 250,000 chickens in our state. These stats make for a really great, intense hunt. With long shots featuring big flushes of 25 to 200 birds at one time, prairie chicken hunts with us are a real eye opener, for sure! Over the past ten years, Missouri Valley Guide Service has made it a point to seek out the best chicken areas in the Midwest. This is a bucket-list trip! If you're an upland bird hunter, this is must have on your belt. And boy, do we have the places with chickens!